A few years ago FBI agents walked into the Baltimore Examiner’s office on the 11th floor on Pratt Street for an interview about the Robert Lee Clay case. I was the managing editor of the newspaper. Clay died in his Baltimore office from a gunshot wound to the back of his head a few days after he agreed to blow the whistle on the city’s minority contracts in an exclusive interview with the Washington Examiner. Clay, a prominent Howard County minority businessman claimed he had enough information to prevent then-Mayor Martin O’Malley from becoming the next governor. A bullet ended that interview from taking place. Police said Clay killed himself. The Baltimore Examiner reported he killed himself with a stolen gun using his left hand to awkwardly put a bullet in the back of his head. He was right-handed. They never found the bullet. The Examiner stories prompted NAACP protests and calls for the FBI to reopen the case. That’s why the FBI came to the Baltimore’s office. During that FBI interview then-Prince George’s County Executive Jack B. Johnson’s name came up during the conversation, not about the Clay case, but – in general – about the investigation into the “pay for play” allegations that circulated around Johnson for most of his political career. He was accused of taking kickbacks from developers to do business and hiring cronies who had no business or experience to do the jobs he appointed them to. I laughed. I covered Johnson as a reporter and now a managing editor throughout his political year – and it was no secret that he made as many enemies as friends – especially in the FBI. He made enemies in Annapolis on a regular basis starting with Sen. Mike Miller. He made enemies with police officers for prosecuting them at times and not prosecuting some at other times. He made enemies with the press who rarely gave him credit when he actually deserved credit. He made enemies with judges because he never prosecuted cases when he was a State’s Attorney, and enemies even on his own staff. It was so bad at times that I remember getting boxes of records detailing when his car left the parking lot in Upper Marlboro while he was serving as a deputy state’s attorney. His own prosecutors would dig up dirt and hand it to me. The point was to show he rarely put in an eight-hour day – even though he could successfully argue he was out in the community working. His enemies wanted him; they wanted him in prison. The interview ended – and I thought that would be the last I would hear about Johnson, but it wasn’t. A few years later I found myself working as a freelance contractor for his administration. I never envisioned myself doing public relations – or for that matter doing it for Johnson. During the heyday of journalism walking to the other side for more money – and better bennies, often got you ridiculed by peers who called it “selling out.” But when the journalism recession hit, no more ridicules. Now making that switch among peers is called paying the mortgage. So after writing some of the more critical stories about Johnson in my career – from reporting on drug cases that were being tossed out on a regular basis, to high-profile homicide cases being dismissed because of shoddy police work, I was going to promote his work as a county executive. I laughed. Johnson had a big imagination. He imagined himself in a lot of positions but not in the place where he would eventually end. While I’m reading the quote, Johnson’s top spokesman Jim Keary shows me a photo of himself with Johnson with Marion Barry. Barry and Johnson? That’s a match. It didn’t seem that long ago when then State’s Attorney Johnson threw a going-away party for me with a cake and a speech. He said he was glad I was moving on from the Prince George’s Journal to a national beat at a new job. It was time to move on as well. Johnson had employed a press officer – the first one ever in the State’s Attorney’s office, which to me was simply another barrier to climb, even though Jack said I could go straigtht to him and avoid dealing with his new roadblock. At the party, he said he used to rush to get the newspaper to find out what was going on in his office. Sure enough, that explains the 7 a.m. pager calls I would get from Johnson when he was upset at another botched up case being exposed or investigative stories showing 50 percent of the homicides going unsolved in the county. My contacts among the bench and within the state’s attorney, public defenders and police department were deep. Johnson told me that I often knew information before he got it. It was frustrating to him. I could tell because when I returned those pager calls, it wasn’t always a pleasant conversation. He would blow off his steam and then move on because he knew I was just writing the truth – no matter how ugly it got. I got a lot of my information for stories because I was granted unprecedented access. I was invited to bench conferences, invited into chamber discussion, invited into the public defender’s brunch buffets and invited into Johnson’s office without having to sit and wait for permission. I sat in Grand Jury instruction rooms, sat in a jury box in District Court cases, where no juries issue verdicts, sat in a closed-door rooms where prosecutors debated who should get the death penalty. I knew the deputies, the bailiffs, the court reporters, and most of the prominent attorneys and homicide detectives. I was handed sensitive files, documents, and met sources in garages and at small-time poker games held in the back of liquor stores. Judges told me to investigate suspicious suicides and police asked me to investigate cold-case homicides. I had judges calling me at home – wondering how I got certain records, and detectives calling on me to tell me to stop writing about certain stories, inmates calling me from jail and Johnson calling me at all hours of the night telling me about press conferences he was calling because of what I wrote. I owned that beat. 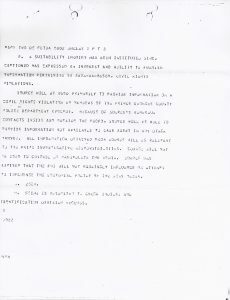 I left the Journal newspapers not long after writing a series of articles that cast doubt on the Jeffrey Gilbert case. (His real first name was actually Jeffery because his name was misspelled when he was born.) Gilbert was charged as the “Cop Stalker,” who shot police officers with a MAC-11 machine gun and took police officers’ weapons as trophies after the killings in 1995. He was accused of wounding two officers in Washington, D.C., and executing Sgt. John Novabilski in Kentland. 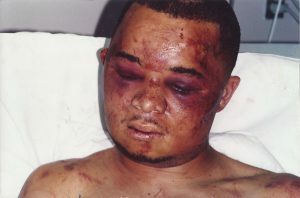 During Gilbert’s arrest, the “elite” T-70 swat team beat him so badly that he nearly died of brain damage. “This is what I call justice – street justice,” one of the officers said after the beating. A photo I knew would tell the story so much better, because the police downplayed the injuries after the arrest, claiming it was minor and occurred because he resisted arrest. I managed to get Sharon Weidenfeld, a tenanciaous private investigator to sneak into the hospital room and snap a picture of Gilbert’s swollen face. I managed also to get doctor’s reports on Gilbert and then got an exclusive interview with the doctor who treated him. The story was full of quotes, medical reports and explosive graphic pictures. I had it all. But my managing editor got cold feet. He killed the story. I blew up at him and the city editor for holding a story that was so explosive. The managing editor was convinced Gilbert was guilty and the paper would simply be hated by the police and the fire department, where he worked as a volunteer. I walked out of the news room furious. No guts. Johnson was going to be pleased and he would get his death penalty case. A few hours later I got a late night call from the city editor who said the managing editor changed his mind. It will run after the officer’s funeral. We plastered the story on the front page. Every local news station picked up the story, and then it hit the national spotlight. Nightline produced a hard story on racial tensions and police brutality in the most affluent African-American county in the nation featuring the Gilbert case as proof that nothing has changed much in 30 years. Johnson was furious about the stories, especially when this one appeared to be a slam dunk death penalty verdict. I started writing a series of stories questioning the evidence in the case, and questioning whether police arrested the wrong man. Homicide prosecutor James Papirmeister went so far as to scream at me on the third-floor of the courthouse, claiming they had the right guy and that my stories were simply hurting the case and doing an injustice to fallen police officer Novabilski who was shot-execution style outside a Kentland liquor store. Papirmeister wanted the death penalty for Gilbert. ‘Where are you getting your information from?” said Papirmeister, who was known as the “minute man” because his slam dunk cases took about six minutes for a jury to deliver a conviction. I said nothing while he continued to scream at me. “Where did you hear that? I haven’t heard that,” he snapped at me. Johnson was wishing I would just go away. I didn’t. I kept reporting and writing front-page stories. I started writing stories about three reported witnesses who had severe credibility problems. I looked at the star witness in the case – a self-proclaimed Washington, D.C., police informant named Darryl Hensley, questioning what he saw on that night. D.C. police have never even heard of him. Hensley identified Gilbert as the cop stalker. Police kept Hensley in a secret hotel for protection and never looked into his background. The document led to another witness that I interviewed, a mentally disabled youth who later won the Chief’s Award for helping out in the case. The youth told me how he threw bicycle part at a window on a second floor apartment. The window broke but his action broke up a domestic fight with a man who was beating up his girlfriend. Police said it could have turned deadly between a man the neighborhood called Doody Doo and his girlfriend. The “smoking gun” document was a statement from Doody Doo’s girlfriend. Ralph “Doody Doo” McLean had confessed to her that he was the “Cop Stalker.” He told her that Gilbert was innocent. He apparently was upset that Gilbert was getting all the headlines. The smoking gun document immediately led to a new hearing and the judge was going to rule on whether Gilbert would be released. That wouldn’t happen until a bloody shootout on Memorial Day involving county officers and the FBI. An FBI agent and a K-9 were killed, but so was “Doody Doo.” Next to Doody Doo stood the trophy – Novabilski’s service revolver. I felt somewhat vindicated and saddened at the same time. Years later Gilbert sued Prince George’s County. He settled out-of-court, reportedly for more than six figures, but no one knows for sure because it was sealed. The joke was they might as well rename Prince George’s to Prince Gilbert. The mentally disabled youth whose single act of bravery for busting that window to break up a fight broke the case for me, Gilbert’s defense team and the police, although the police ignored it initially. Police were called to the scene for the domestic disturbance and wound up taking that statement from the girlfriend. Homicide never got that statement or didn’t want it. The statement was not made public until I got it. The youth picked up his award from the police chief, who praised him for his act of valor. The next day police officers saw him standing next to a fence. They beat him up for reportedly loitering. “Don’t tell me,” he said. FBI: Will you run a wire? The Justice Department launched a probe into the Gilbert beating, but they could never break the blue wall of brotherhood. Federal prosecutors were calling me at my home and the FBI even approached me at one of my weakest financial times when my heat pump broke, my car barely ran and I had hardly any money to feed two small children. 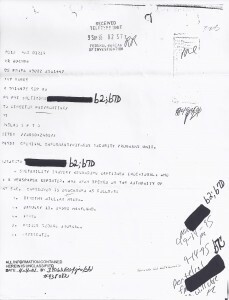 Part of my FBI file. My code name: Watergate. 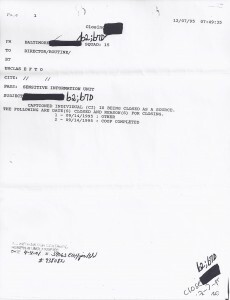 FBI closed my case as a source on Sept. 14, 1995. Over a pizza at Ledos in Upper Marlboro, the FBI asked me to run a wire. They said they even could take care of my needs. All I had to do was tell them what I needed. It would be nice to have working heat, I thought. After I turned it down, the FBI agent was transferred to work the Oklahoma bombing case. The federal prosecutor kept calling me at home. She didn’t want to meet face-to-face because it wouldn’t look good for a prosecutor holding one-on-one conversations with a reporter. But eventually she dropped the case. She couldn’t get any officer to break. In a strange way the Gilbert case turned my relationship around with Johnson’s administration. If I said I had something, Johnson and his team knew I had something. They didn’t like me too much, but I earned their respect and a tower-cake at my going-away party. After that party I never envisioned our paths would cross again. I remember that incident as well, keep reading the series. It’s covered. Thanks for the feedback. An excellent story Tim. As a retired PG police officer I didn’t remember a lot of this until I read your story . . . I loved it! I remember Jack Johnson when he was just an assistant state’s attorney passing bad checks at a store in Oxon Hill. Dave Statter did a story on that incident, where Jack threatened the store manager (and grabbed him by the arm – all this was on video) if he didn’t accept his check, he would no longer prosecute bad check cases for the t/a. He was a crook way back when and it’s sad that it took so long to bring him to justice! I remember your days at the Journal 🙂 Great job!